Today’s featured styled shoot was inspired by a sweet love poem. “Time is endless. Love is true. I wish endless time spent loving you.” This poem was written 12 years ago by Lauren Watson, owner and lead Planner of The Lion House, to her high school sweetheart, now husband. The design is sweet and romantic with a natural, yet bold, intimate feel. 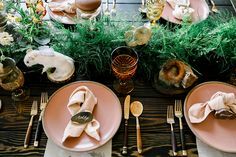 Mix of muted and bold color tones (rose, natural, and fern). The backdrop for this shoot, La Jolla Woman’s Club, is a historic landmark over 100 years old. 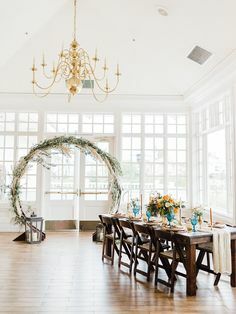 It’s modern style, exemplified by simple geometrical shapes, and generous use of arches and columns, with a minimum of ornamentation lends itself to be the perfect venue your big day. 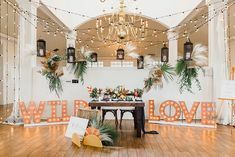 The glorious bright windows, beautiful archways, and lush gardens (a rarity in Southern California) really set the tone for this styled shoot. 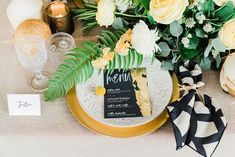 A few details we’re obsessed with: the hand calligraphy on the silk table runner with the couples favorite lyrics, cigar bar for the gents, custom jewelry by Simply Kasia and gorgeous Dress Theory gown. TIP FOR BRIDES! Be sure to play up the features of your venue. Use each piece to your design advantage if possible. And use/create items that can be displayed in your home afterwards. These signature cocktail signs would be the perfect addition above that new bar cart you were gifted from your registry! The custom calligraphy table runner can be used during home gatherings and will act as a reminder of your big day every time it’s laid out. Wow, this is stunning! Absolutely love the high-class simplicity. This is what we had in mind with High Time Photo Booth. We were aiming to keep our photo booth sleek and simple yet high quality and tech savvy. Wowww, this is awesome! I really love the decor, furniture, flowers, glasses. Every detail is amazing!